A collection of Albert Einstein's papers are to go on sale next month in London, reportedly expected to garner at least $1.5 million. The papers reveal Einstein's struggles, failures and doubts -- ironically made worse by an apparently shaky grasp of mathematics, The Guardian reported Monday. 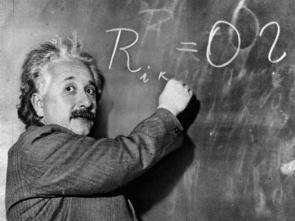 The collection details Einstein's accomplishments in physics, including his unprecedented general theory of relativity in 1916, as well as his frustration at not being able to achieve "a grand theory of everything." The 15 manuscripts and 33 letters written between 1933 and 1954 were collected by Ernst Gabor Straus, a young mathematician whom Einstein selected to help him during his time at Princeton University. The papers have been privately held by Straus and his family, The Guardian said, noting Einstein scholars were not aware they existed until Straus's wife and son decided to put them on the market. The Straus family decided not to auction the material, since selling the collection as a whole would command a higher price, the newspaper said.